Freising is a town in Germany, in the Bavaria and it is located just north of the larger city of Munich. The city has two famous hills located in it that are very easy to spot from a distance and help to identify the town. Freising is a town in Bavaria, Germany, and is a popular tourist destination due to its close location to Munich and its historic architecture. It has two famous hills that help to identify the town, these hills can be seen from Munich airport; the cathedral hill has Bishop's Castle and Freising's Cathedral sitting occupying the top of it, and the world's oldest brewery sits atop Weihenstephan Hill. Photo of the Rathaus and St Georges Church in the Marienplatz in downtown Freising, Germany, Europe. Some historians say that this area was settled in the Bronze Age, but there is very little evidence to support this. There was small pockets of settlements in the area as early as the Bronze Age, but not a continuous settlement. 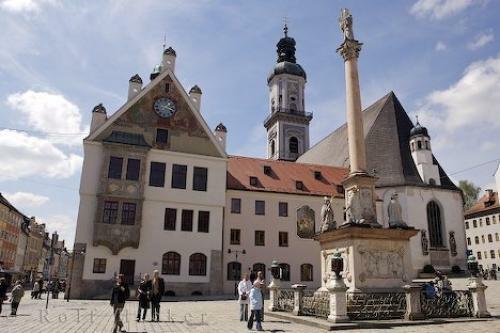 Today visitors visit Freising to see the history and architecture and experience a slice of German life in a smaller city to Munich. The Rathaus (town hall) and St George's Church in the Marienplatz in downtown Freising, Germany, Bavaria, Europe, Europe 2006. I photographed this photo with the digital SLR camera model Canon EOS-1Ds Mark II, aperture of f/7.1, exposure time of 1/200 sec. on ISO 100, as always I used a original Canon Lens, the focus lenght for this picture was 27mm.